Two 16-year-olds used a public Wi-Fi hot spot for Facebook updates and a video chat on a recent night in Havana. HAVANA — The busy stretch of 23d Street in Havana that slopes upward from the sea wall is known as La Rampa (the Ramp). It’s a fitting name for the place where many Cubans are discovering the Internet for the first time. Walk along La Rampa on a typical evening and the sidewalks are jammed with young Cubans, their faces lit up in the blue glow of laptops, tablets, and phones. They’re on Facebook or chatting with loved ones and friends in Miami and beyond, shouting over the din of bus engines and old Russian Ladas groaning up the hill. La Rampa is one of five places in Havana — and 35 in Cuba overall — where the least-connected country in the Americas suddenly has public Wi-Fi. They’re like water-slide parks put in the middle of a desert. Expanding Internet access was one of the things the communist government agreed to in its talks to reestablish relations with the United States. But Cuba, of course, is doing it in its own particular way. Instead of offering mobile data plans through the state telecommunications monopoly or residential service, the government has wired up a series of large Chinese-made Huawei antennas at a handful of outdoor locations like La Rampa, turning sidewalks and parks into sprawling Web lounges. When the Wi-Fi works, that is. With hundreds of people trying to log on, day and night, the networks are often maxed out. The Cuban government says the only obstacles to improved Internet access are technical and financial, not political or ideological. It has set a goal of 50 percent household penetration by 2020; at recent count, only about 5 percent of Cuba’s 11 million citizens have regular Internet access. But it has also said it will prioritize ‘‘social’’ Internet use at schools, hospitals, and other public institutions. Social use on La Rampa is like a bigger, grimier version of Starbucks, without the coffee or the bathrooms. Cubans surf from the sidewalk late into the night, and during the day they jam into patches of shade to escape the withering tropical sun. Despite the lack of amenities, no one was complaining the other evening about not having high-speed Internet at home. Several young Cubans lauded the festive atmosphere. This being Cuba, it took black-market entrepreneurs about two minutes to turn the government’s Wi-Fi service into a nifty business opportunity. The $2 scratch-off cards that the state telecom monopoly sells for an hour of prepaid Wi-Fi are bought up and hoarded by ‘‘resellers’’ who walk up and down La Rampa selling them for $3 apiece. ‘‘Cards, cards,’’ they mutter in hushed tones, like drug pushers. More tech-savvy Cubans set up their own parallel Wi-Fi networks on La Rampa, using apps like Connectify that allow a single prepaid card or account to be shared among several users. They offer Web access for $1 an hour to multiple customers at a time, albeit at slower speeds. Cubans who do this say the police don’t even bother trying to stop them, though resellers of Wi-Fi cards risk arrest and fines. ‘‘They took me down to the station yesterday,’’ said one 24-year-old card vendor who was back at work the next day, undeterred, after an $8 fine. 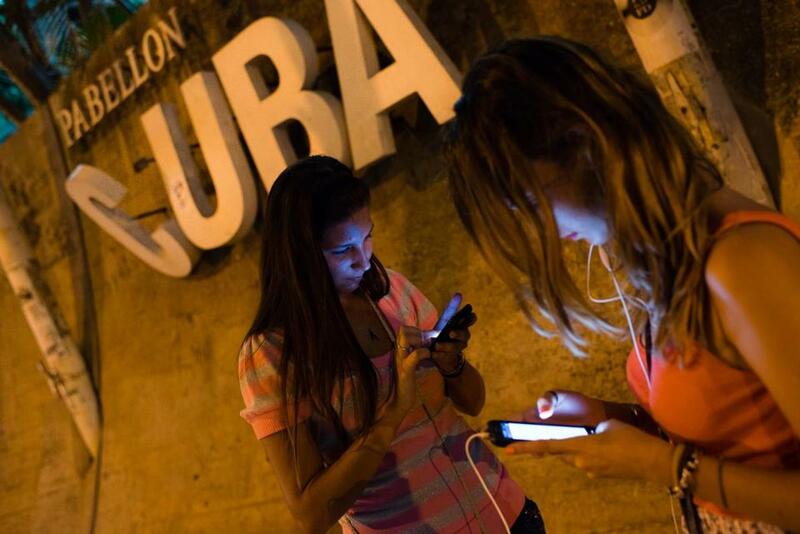 Just as Havana residents use the city’s Malecon sea wall as a huge open-air lounge for drinking and playing music, they are turning the hot spots — the first places that allow Cubans to freely get online with their own devices, with the enhanced sense of privacy and freedom that comes with it — into places to party and browse the Web. Some anti-Castro sites are blocked on government servers, but others are not, and for the most part, Cuban Wi-Fi users have access to the global Internet. Though not as fast as US broadband, there’s enough bandwidth to stream YouTube clips or baseball highlights. The government blocks Skype, so Cubans use a program called Imo for video chats with friends or family abroad. Rodriguez makes her living by renting out a room in her home to tourists. Both her children have left for the United States. She has never traveled off the island, she said, nor used Wi-Fi before. Rodriguez and two friends stood under the street lamps for at least an hour, but the network was too overloaded to let her log on. The video chat would have to wait. But her friend got lucky for a few minutes, long enough to look at photos of Rodriguez’s daughter’s apartment on Facebook, and send a message saying she’d try again the next day.